“We don’t just produce a painting for the wine label, we go a step further in producing a painting for the wrapping paper as well”, says Peter Femfert of Fattoria Nittardi with a mischievous smile as he was talking about his Casanuova di Nittardi wine. 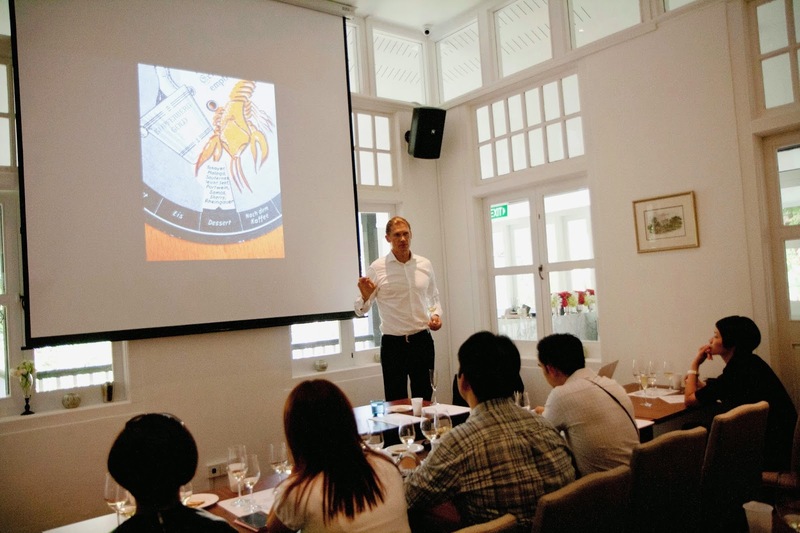 Peter Femfert was in Singapore early this month to introduce his wines to a small group of wine enthusiasts. We had the opportunity to get an introduction to his wines, understand the reason behind the beautiful wine labels & wrappers and obtain some information on his vineyards. Upon acquiring Fattoria Nitarrdi in 1981, Peter Femfert took the opportunity to marry wine with art. He invited Bruno Bruni to create 2 paintings; one for the wine label and the other for the wrapping paper, for the 1981 Casanuova di Nittardi (the first vintage under his ownership). The project was so successful in garnering interest and support from wine enthusiasts that he decided to make it an ongoing art project for the upcoming years. Every year since then, an artist is invited to create 2 paintings (one for the wine label and the other, for the wrapping paper) for the Casanuova di Nittardi wine. To date, 31 artists have participated in this project and contributed 62 artworks. The most recent artist to participate is Korean artist Kim Tschang-Yeul who contributed his efforts to the 2011 vintage. Some of the other renowned artists who have participated in this project include Friedensreich Hundertwasser, Horst Janssen, A.R. Penck, Mimmo Paladino and Günter Grass. Michelangelo Buonarroti, owner of this estate in the 16th century, not only produced wines but also sent Nittardi wines to the Pope in Rome then as ‘genuine gifts’. This estate has been a stronghold tower, a farmhouse and a vineyard offering grapes for wine production for a good period of Tuscan history. Nittardi is located 450m above sea level, within the Chianti Classico region. Presently vines occupy 12 hectares of Nittardi’s land. Sangiovese is the main varietal grown here, followed by a small parcel of Merlot and ‘old vines Canaiolo’. The two Chianti Classico wines are produced here are 'Çasanuova di Nittardi' and 'Nittardi Riserva'. The second vineyard is located in the Tuscan coastal region of southern Maremma. Located 18km from the sea and 240m above sea level, this land is locally known as ‘Mongibello delle Mandorlaie’. It was acquired in 1999 and planting of vines started soon after. Presently there’s 26 hectares of land under vine (20 hectares of own land and 6 hectares on rented land). Grape varietals grown here are: Sangiovese, Cabernet Sauvignon, Cabernet Franc, Syrah, Petit Verdot, Alicante, Merlot, Vermentino, Roussanne and a few other varietals on an experimental basis. Since early 2000, two supertuscan reds come from this vineyard; the “Ad Astra” and the “Nectar Dei”. In 2013 a white wine was introduced as well; the “Ben” made from Vermentino. Peter Femfert clarified that 'Ben' stands for ‘Beniamino’, meaning “the youngest and most beloved child” in Italy. 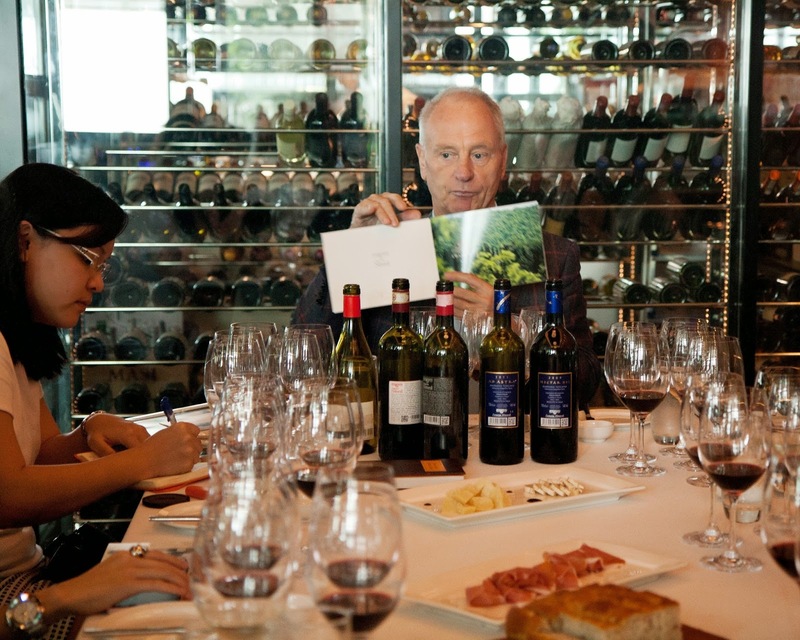 A participant queried about the intended style of Nittardi wines. 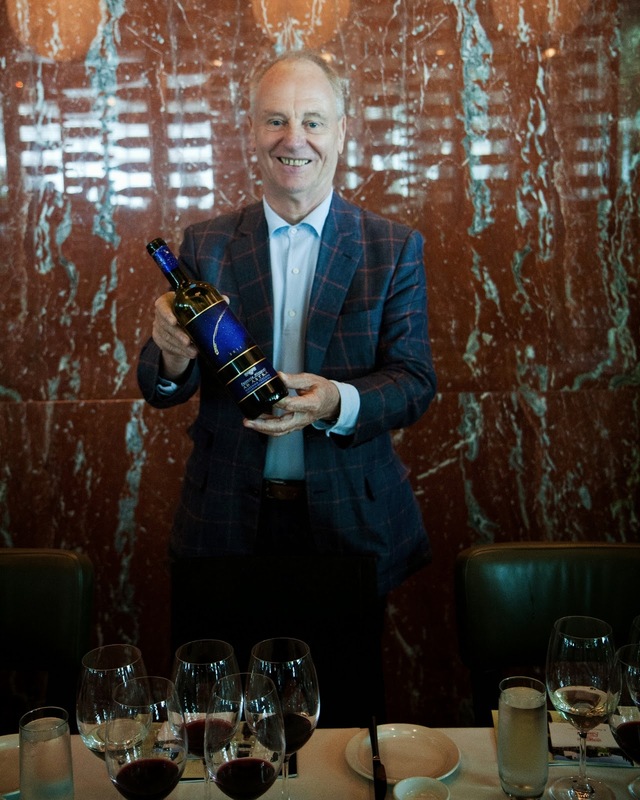 Peter Femfert mentioned that he strives to produce wines which display "roundness, softness and fruits in the palate”. “Flavours may change year to year based on weather conditions and other unforeseen elements, but these 3 characters are what I like our wines to show”, he explains. First released in 2013, it’s a single varietal wine made from Vermentino. Fermentation and 6 months of aging in stainless steel tanks help the wine retain freshness. Nose shows citrus and mineral notes. A medium bodied wine, it reflects similar characters in palate as well. Refreshing acidity keeps the body alife in palate and helps to one to experience a ‘long finish’. I must say that the good body weight displayed in the palate makes this wine even appropriate for main dishes with a medium body weight as well. Buy to drink (there’s no need to age this wine). (Sangiovese 97%; Canaiolo Nero 3%). Grapes for this wine come from land located 450m above sea level. Fermentation takes place in stainless steel tanks. Aging takes place for 9 months in French oak barrels; followed by another 6 months in bottle. Floral note, spice and cherry fruit aromas greet the nose. Dark cherry and spice notes dominate the palate, while soft tannins and refreshing acidity offer support. A wine made to be drunk young; it’s approachable at this moment. (Sangiovese 95%; Merlot 5%). Grapes for this wine come from Vigna Alta, a south facing plot located 500m above sea level. The wine is only produced in exceptional years. Fermentation takes place in stainless steel tanks. Aging takes place for 24 months in French oak barrels; followed by another 6 months in bottle. Ripe dark berries and spice notes show on the nose; palate reveals a full bodied wine with dark fruit (black currant) flavours. Palate reveals a smooth texture; tannin and acidity show themselves offering structure. There’s a degree of austereness showing in the palate as well. A wine with depth and complexity, it shows the potential to develop further with age. (Sangiovese 40%, Cabernet Sauvignon 25%, Merlot 15%, Syrah 15%, other varietal 5%). According to Peter Femfert, this is his best selling wine at the moment. The grapes for this wine come from the Mongibello delle Mandorlaie estate in Southern Maremma. Fermentation takes place in stainless steel tanks; aging for 9 months in French oak barriques followed by a period of bottle aging before release. This wine holds a deep red core with purple hints in the rim. Aromas display intense berry fruit and plum notes. The palate shows roundness and a generous ‘mouthfeel’ of fruit flavours. Soft tannins and acid support the fruit flavours rather than overwhelm it. A wine made to be enjoyed in its youth; but can be kept for mid-term aging as well if one is so inclined. (Cabernet Sauvignon 40%, Merlot 20%, Syrah 20%, Petit Verdot 15%, other varietal 5%). Fermentation takes place in stainless steel tanks. Wine undergoes aging for 22 months in French barriques and another 6 months of aging in bottle. Wine showing a red-black core in the glass. Red & black berry fruits and spice notes greet the nose. A similar profile of berries, spice and hints of vanilla show in the palate. A full bodied wine with a smooth and supple body. Good depth and complexity; an elegant wine (reveals fruits without being too upfront or showy). A wine with a potential to develop if aged further. Peter Femfert explained that in keeping with Michelangelo Buonarroti’s tradition of sending wines to the Pope (as was practiced back then in the 16th century), he makes it a point to send a case of Nectar Dei wines to the current Pope each year. In Asia, the 3 biggest importers of Nittardi wines are China, Korea and Japan; and these wines can also be found in Korea, Hong Kong, Thailand, Taiwan and Singapore as well. 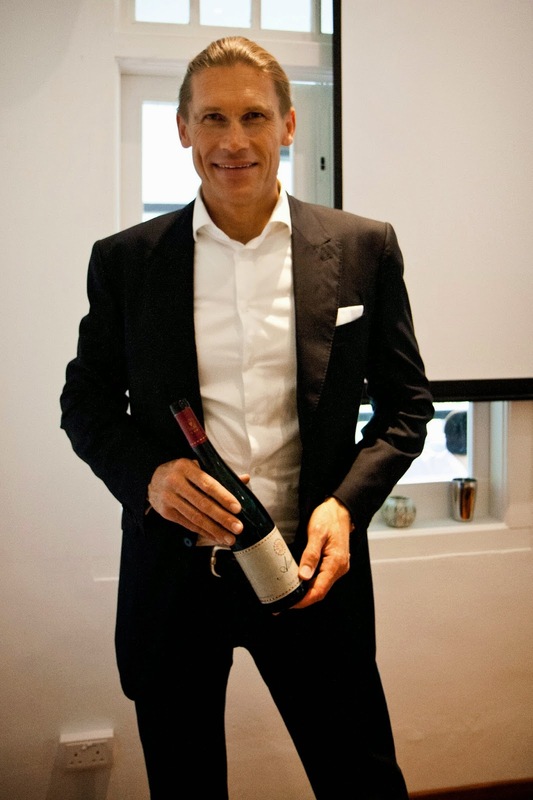 Roman Niewodniczanski (owner of Van Volxem wines) is a tall man. Yes, this blog entry is about his wines, but it’s difficult to focus on the wines before acknowledging, accepting and moving past this observation. I believe he is the tallest gentleman I’ve seen on local soil. 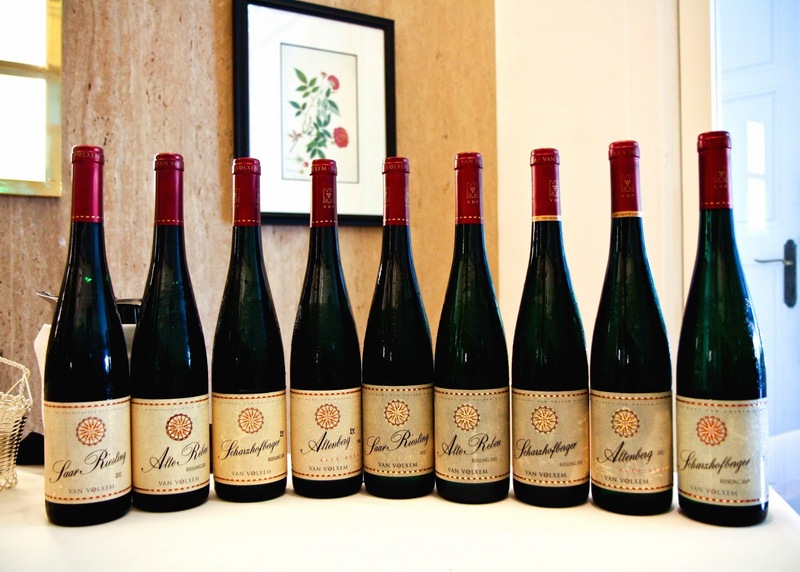 He was here earlier this month to share his views on 9 of his Riesling wines. Wein & Vin was the local organizer of this event. One needs to understand a little about the man to better appreciate his wines. Roman Niewodniczanski was not ‘forced into’ this enterprise of winemaking. He did not come from a family of wine producers. He made a conscious choice based on freewill to pursue this profession. He is also a student of history. More than half the time spent during this masterclass was focused on the history of wine making in Germany rather than his wines. He discussed the affairs of German winemaking since the time Romans first introduced winemaking into the country to the current trend in winemaking. He drew our attention to how things changed drastically during the 20th century (highlighting the influence of the World Wars, the displacement of people during these periods and the effect it had on German wine making to show how wine style changed over different time periods). His slide presentation was peppered with sufficient pictures of old letters and documents to not just awe but help one appreciate the passage of winemaking in Germany. He understands the past, knows what is needed for the present to produce quality wines which he can be proud of, and seems to be comfortable with taking up that pursuit. “Wines should be made not for the purpose of receiving high ratings but to be enjoyed”, he says. And to produce wines to be enjoyed, he favours keeping harvest yield low (averaging 40hl/ha), adopts hand harvesting and a rigorous berry selection process which ensures that only ripe grapes are harvested. Its a labour intensive endeavour, but one nonetheless employed to ensure quality grapes with ample ripeness are harvested. Organic farming methods are used to ensure the land is treated with respect. In the winery, the grapes are treated to gentle pressing and a slow vinification process in order to retain fruit character and freshness. Indigenous yeasts are used during fermentation to express the individuality of each vineyard (the expression of terroir being favoured in the wines produced). He does not adopt the Pradikat system for wine making or labelling. He goes by producing a single wine from an individual plot to reflect the plot’s unique terroir. He’s contented with it. Location helps. In order to ensure ripening of grapes, ideal plots have been acquired. Van Volxem’s Scharzhofberger vineyard is located in Wiltingen (a wine producing village located on the lower Saar river). This vineyard has the honour of being classified an ‘Érste Lage’ (a vineyard with a first-class site, denoting exceptional terroir). Adding to this land bank are purchases made in Kanzemer Altenberg and Wawerner Goldberg, both quality sites. Do I see some common virtues between the wines tasted? Of course there is. When ripe, good quality Riesling grapes are used to produce wines (under a common wine making philosophy) some common traits will arise. Descriptions like slate, mineral, citrus, good fruit presence in the body, racy acidity, good structure and balance, and a lingering finish are qualities one observes across these wines. The difference at play seems by and large to be the level of ripeness within each wine, the body weight experienced in the mouthfeel and the vibrancy felt in the palate. By and large I find the 2012 vintage to be observing a fuller body, a rounded mouthfeel, more fruit ripeness in flavours (backed by racy acidity) compared to the 2011 vintage. Don’t get me wrong, both vintages reveal good quality, the 2012s just show themselves a touch richer and riper in the palate. Two ideal 'value for money' wines to try within this range would be the Saar Rieslings. The show the attributes of Van Volxem wines (in differing body weight and mouthfeel). Light yellow with green highlight greets the eye. Mineral and slate aroma notes. Dry, light plus body; mineral and citrus flavours show in the palate, with generous acidity providing structure and extending to the finish. Yellow with green highlights in appearance. Heady mineral and slightly floral aromas which leap from the glass. Medium plus body, a roundness in texture and a rich mouthfeel with lots of ripe fruits (citrus, peach). The ripeness is held at bay by racy acidity which acts as a counterfoil. Intense in flavour, yet refreshing. I particularly enjoyed the Van Volxem Altenberg Alte Reben Riesling 2012 and Van Volxem Scharzhofberger Riesling 2009. In addition to a rich body with depth of flavours and good weight, they also displayed a certain vibrant (racy, lively) feel in the palate. A little difficult to describe, but great to enjoy. Ok, I'll digress a little here. We always say “don’t get distracted by the wine label (be it text or picture); to drink and judge the wine by what’s in the glass”. But it’s difficult not to get distracted by this label. Well designed, arty and stylish I must say. When the wines were lined up at the table, one gets easily impressed with the creativity which went into the design process of this label. Bodegas Arzuaga Navarro is a relatively young winery which began operation in the 1990s. It is located in the village of Quintanilla de Onesimo, within Castilla y Leon (in the Ribera del Duero wine region). They say location counts, and having Vega Sicilia and Pingus as ‘neighbours’ certainly add to the curiosity and quality expectation of what these wines have to offer. (Yes, one should refrain from attempting such comparisons; but let’s brazenly lay it on the weaker side of human nature … it’s difficult most times not to compare). 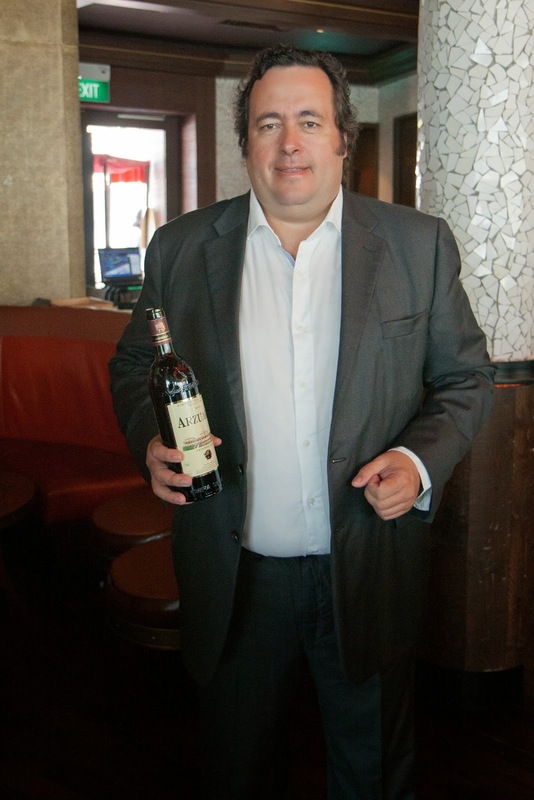 Ignacio Arzuaga Navarro (the son of this winery’s founder) was at hand to present the wines. We had the opportunity to taste 6 wines. Three were single varietal wines made using Tempranillo. The other 3 red wines were blends made with Tempranillo, Cabernet Sauvignon and Merlot varietals. a body which displays a smooth and supple nature. These are wines you can drink now but they possess the potential to develop further if kept to age longer. The vinification process is similar to that of the earlier wine. It undergoes stainless steel fermentation but gets to spend a longer time (16 months) in French and American oak barrels. The nose reveals berry aromas with a hint of liquorice in the background. The texture becomes immediately noticeable in the palate. You get smoothness, roundness and a creamy feel playing in the palate. There is a good balance between the fruit, acid and tannin components. This is a well integrated wine with a good finish. This has been aged for more than 18 months in French and American oak barrels. Aromas reveal dark fruit notes with a hint of toast and leather. Body is elegant and supple. The ripe, dark fruit body with a hint of spice is balanced with a good amount of acidity. Another wine with a lingering finish. (All wines tasted above are of good quality. But this wine is slightly ‘special’ in the making.) The grapes are from old vines, the harvest offers very low yield and consequently production is very limited. Vinification is also slightly different as wooden tanks and French oak barrels are used during the fermentation process. French oak barrels are also employed for aging (24 months) in the winery. Ripe fruits and spiciness reveal themselves to the nose. Palate shows dark fruit notes and toast. Tannins are present but not harsh; they are well on the softer side. The nose ‘opens up’ when this wine is given some time to breathe in the glass. (This wine owes part of its specialty to the fact that it carries the name of Ignacio Arzuaga’s sister, a renowned designer in Spain.) Grapes from old, ‘pre-plexora’ vines are used for the production of this wine. Natural fermentation is employed in the vinification process and the wine produced is left unfiltered. It was first made in 2006. Slightly of a deeper red hue, it reveals floral notes to the nose. Palate reveals dark berry characters, seamless texture with a good depth of body. Acidity in the body adds to the liveliness of the palate. A wine worth aging. 6. 2001 Bodegas Arzuaga Gran Reserva (90% Tempranillo, 5% Cabernet Sauvignon, 5% Merlot) This wine possesses a ruby red colour with a watery-edged rim. Aromas of herbs, spice and cedar greets the nose. The body reflects the aroma profile. Nice depth and flavours reveals themselves in layers. The noticeable acidity and soft tannins offer a well integrated body (a condition helped by spending 22 months in oak barrels). A smooth and elegant sip, it offers a lingering finish. I must share that this 'newer' style of Spanish wines with its fresh fruit presence and vibrant body offers a pleasant contrast to the rustic (and at times tired), dried fruit character type of profile seen previously in some wines from Spain. For more information on these wines, you can contact: Cellarmaster Wines (Singapore) at 67665185.